THE 6TH STUDIO DISC FROM AUSTIN, TEXAS BLUES/ROCK HEAVY GUITAR LEGEND VAN WILKS, FEATURES 12 TRAX (59 MINS.) OF OUTSTANDING, AWESOME, HARD-EDGED, COMPELLING HEAVY GUITAR-DRIVEN BLUES/ROCK POWER TRIO RIFFAGE IN A CLASS ALL ITS OWN. “RUNNING FROM GHOSTS” IS A STUNNING, SOULFUL, BLUESY HEAVY GUITAR MUSICAL RIDE THAT YOU WON’T SOON FORGET. 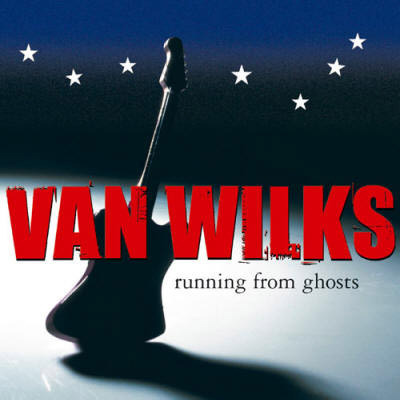 VAN WILKS IS AN AMAZING, GIFTED GUITARIST WHO HAS CREATED HIS OWN STYLE AND TRADEMARK SOUND AND HE REALLY SHINES ON THE “RUNNING FROM GHOSTS” DISC. NOT ONLY IS VAN WILKS A BRILLIANT RIPPIN’ AXESLINGER, HE ALSO HAS AN EXTREMELY KOOL SOULFUL MELODIC VOCAL DELIVERY THAT SETS HIM APART FROM THE REST AND FAR SURPASSES THE NORM. ON TOP OF WHICH, VAN WILKS IS AN EXCELLENT SONG-WRITER / RIFFMASTER WHICH IS CLEARLY EVIDENT ON “RUNNING FROM GHOSTS”. AS AN ADDED BONUS, THE DISC FEATURES A STELLAR COVER VERSION OF THE CLASSIC TRAFFIC JAM: “THE LOW SPARK OF HIGH HEELED BOYS” THAT IS ONE OF THE BEST VERSIONS WE HAVE HEARD @ THE GROOVEYARD. VAN WILKS’ AWESOME TAKE ON THIS TRACK AND THE BLUES IS ORIGINAL, UNIQUE AND ALL HIS OWN.